In the spirit of a popular post written earlier this year, I want to share the behind the scenes on our current almost-museumwide exhibition at the Santa Cruz Museum of Art & History, Santa Cruz Collects. This exhibition showcases collectors from throughout Santa Cruz County--people with collections from animal skulls to dryer lint to priceless historic flags. The content focuses on the question of WHY we collect and how our collections reflect our individual and community identities. We used a more participatory design process. Our previous big exhibition, All You Need is Love, was highly participatory for visitors but minimally participatory in the development process. 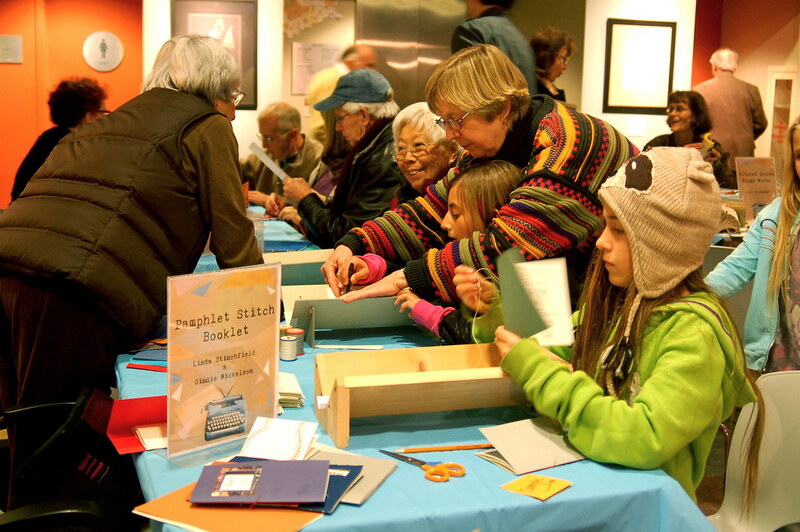 Santa Cruz Collects is based on collections and stories from people throughout our county. That meant months of tracking down leads for people with interesting collections and working with them to develop an approach to showcasing their objects that was cohesive while honoring the diversity of their experiences. We had some money. Instead of a total budget of $200 for participatory elements, we spent about $4,000 on materials for participatory elements in this exhibition. This shift was largely thanks to a grant from the James Irvine Foundation, which provided funding for a key component--the Memory Jar installation. A million thanks to them. We focused more on design. While the Love exhibition was popular, it was our first attempt at full integration of interdisciplinary content on a big human idea, interactivity, and participation. The result was not as visually cohesive or attractive as it could have been. Coming off that experience, we wanted to prove that we could have great design AND great participation in this show. We worked with an incredible intern and staff team to push it to the next level, both by improving the overall visual aesthetic of the show and by focusing in on fewer, more developed interactive components. Santa Cruz Collects has garnered rave reviews visually from some of the same people who were dismayed by All You Need is Love. We're involving visitor services and volunteers more intentionally in facilitation. This is the first time we've had an ongoing activity with a lot of materials (Memory Jars). There are Legos and fake flowers and fabric scraps and sand and a whole lot more. Rather than having our exhibit team walk through and fix things up every once in awhile, we wrote facilitation plans for the Memory Jars and other intensive participatory elements. Our visitor services team is responsible for managing, replacing, documenting, and in some cases, improving these elements now that they are live on the floor. 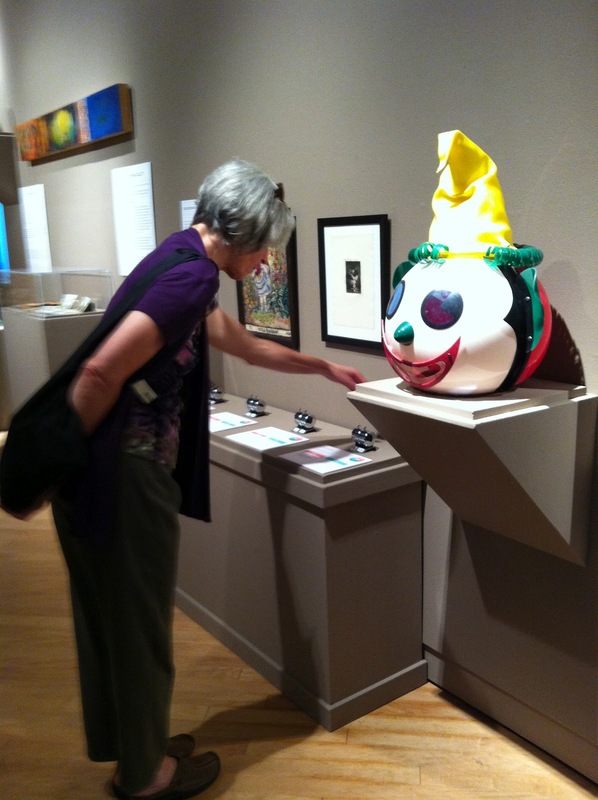 Without further ado, here's what we did to make the exhibition participatory. You can find several more photographs here. I hope there's something in here you can use. As always, I welcome your questions and comments. incredible toasters from 1906 to 1960. We collaborated with community members to source content and develop the show. This is an exhibition built from community members' stuff. We did a series of call-outs to find intriguing collectors. Sometimes, we'd hear something vague about a guy with great branding irons or a lady who showed wild stuff at the county fair. We tracked down as many people as we could and developed a big spreadsheet so we could evaluate the possibilities. We wanted diversity along several axes--stories, types and sizes and scales of collections, perception of value, age of collector, gender, and geographic home base of collector. 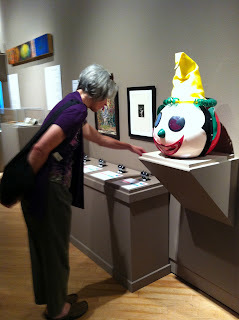 We were fortunate to have an in-house team with varied attention; while I cared most about the stories behind the collecting, our art curator Susan fixated on aesthetics of the objects, and our history curator Marla focused on novelty, diversity of county representation, and whether people were calling us back. Because we wanted a really clean design and a personal feel, we interviewed all the collectors to capture their stories, creating labels that blended their first-person quotes with our curatorial commentary about the "why" behind their collecting. A stellar volunteer photographer, Tony Grant, took a portrait of each collector in his/her element. While some collectors had us select and design the displays of their objects, others collaborated with us to create their areas, adding their own unique quirks (like putting hats on computers to personalize them). 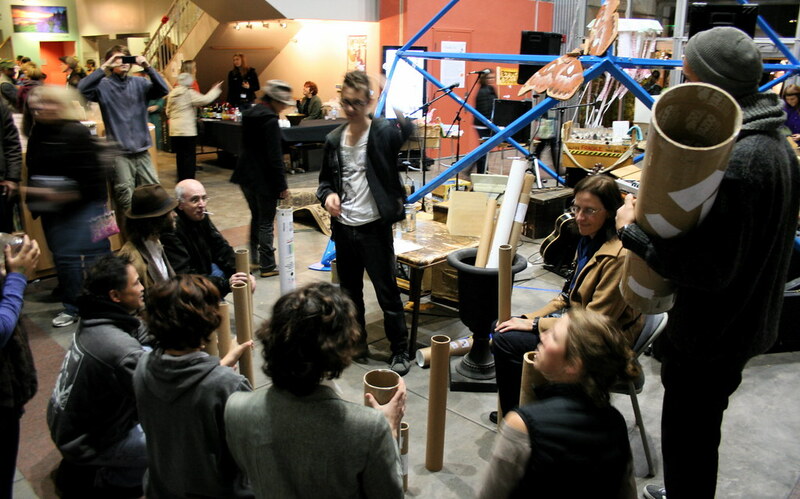 We worked with volunteers and interns again to create soundscapes that focused on collecting. One volunteer captured stories at the flea market; another asked people on the street about the memories they would keep (to accompany the Memory Jars). We worked co-creatively with a group of anthropologists and archaeologists from UCSC to produce a small exhibition on the 3rd floor based on a pre-existing exhibition they had created about how they encounter and work with objects in their global research. We agreed to take the artifacts from their original show but worked with them to rewrite labels and shift the focus to be more personal and in-line with the Santa Cruz Collects big idea. This was a partnership that involved meaty dialogue to get to a shared success; it was important to the anthropologists that we not present fallacious images of them as "collectors" or antiquity hunters, and it was important to us to show the human side of why they work with particular objects. We made a giant mobile for the center of the museum out of origami birds folded from visitor comments received in the past year. Our community programs staff worked with visitors to make the birds, vote on a final design, and hang the mobile over a series of evening events prior to opening. As in the past, we prototyped all interactive and participatory visitor experiences at museum events in the months leading up to the show. The prototypes were all simple, cheap, and extraordinarily valuable in shaping the final product. We have a rule that every prototype must be used to answer a specific question we can act on, whether that's an A/B comparison, figuring out what's confusing, etc. Memory Jars installation. Our first floor Lezin Gallery is small--about 300 square feet. We like to use it as a participatory introduction to the exhibition, to front load the concept that you the visitor are invited to actively contribute to the exhibition at hand. This time, instead of offering lots of little experiences, we devoted the gallery to one experience: making Memory Jars. The idea is simple: floor to ceiling shelving holding mason jars, each of which holds a label that reads "I remember..." We put out donated craft materials and colored pencils and invite visitors to bottle up a memory to add to the collection. This activity was developed after several prototypes intended to explore the idea that some of our most precious collections are not physical at all. We tried collecting dreams, collecting smells or sounds or stories, but memories was most resonant. We decided (with the support of the James Irvine Foundation) to go big and devote the whole gallery to the activity, spending money to build shelves and buy matching jars. Since the activity is so simple to explain, we hired a local illustrator to create a giant mural to provide instructions in an IKEA dreamland style. We collect people's email addresses (opt in) on a clipboard if they want to come get their jar at the end of the show in late November. We've been overwhelmed by participation in the first month. We have 400 jars, of which about 300 are filled already. Some are funny, some are sweet, some are poignant, some are sad. We're going to need more jars. They might not match. Pocket Museums in bathrooms. We also brought back the pocket museums in the first floor bathrooms - see last week's post for more discussion of these and their mixed success. are these objects worthy of our museum? What Kind of Collector Are You? quiz. This is a teen magazine-style flowchart quiz that takes you through a series of simple scenarios and decisions to determine what type of collector you are (based on five major types as defined by psychologists). Participants vote by putting a button in the jar labeled with the type they turn out to be. We've found personality quizzes to be a very popular form of participation; in this case, the layout allows you to either do the quiz and then vote on your type or to vote directly just by reading the labels on the jars. This might be a defect or a good thing. I talked to one visitor who told me, "I knew I was a 'for others' type and then I went back and did the quiz to be sure." Deaccessioning interactive. We stole this idea directly from the 2009 UCL Disposal? exhibition. We picked four objects from our collection with dubious connection to our collecting policy, explained the pros and cons of keeping each in short bullet-style labels, and let people vote on whether we should keep them or not. We were careful to phrase it as "pro/con" instead of "keep/dump" because we didn't want to promise to act based on visitors' votes. After much debate about how to make this feel different from the personality quiz (which also has a voting-style interaction), we decided to use tickers for votes--the same kind you use for counting people at events. People like clicking them, but they also monkey with the reset knobs on the side. Fortunately, anyone who changes the votes changes the pros and cons equally (the reset button only affects the thousands digit). But the voter fraud is worth it. The activity does get people looking really deeply at the objects and arguing with their friends about what we should keep, and we can see their preferences in the votes. Hoarders Anonymous. We didn't want to label any of the collectors in the exhibition as a hoarder, but we knew we wanted to deal with this topic. We created a simple table (made from a cracked vitrine filled with junk) with a hanging "Hoarders Anonymous" sign, an "Are You a Hoarder" quiz, a checklist to take shopping to help you keep from excessive hoarding, and a notebook where people can share their hoarding stories. And pencils. The only problem with this element is that the completed quizzes tend to pile up. They aren't fascinating or personal enough to take home, so they hang around. We thought about a different format for them or a way for people to add them to a "hoarded" pile, but we ultimately decided just to sweep through each day and recycle completed ones. While this table is in the middle of the gallery, people have very intense personal experiences writing in the notebook or doing the quizzes with friends. I credit the intern who developed this for a carefully honed sensitivity to both the seriousness and humor inherent in hoarding. Digital Collections comment wall. One of the special collections in the show is from Bruce Damer's Digibarn--an idiosyncratic personal museum of computer history. We wanted to create a talkback wall that dealt in some way with the fact that computers have become the repositories for many of our collections, and the increasing availability of cheap digital storage has made hoarders of us all. But most of the prompts we came up with--how do you curate your digital files? what are your most important digital collections?--generated boring responses. After internal prototyping, we came up with a prompt about the opposite of digital collecting--digital loss. The current prompt reads, "I deleted those files because..." and the setup is designed to resemble an old-school computer terminal. It has generated wonderful and diverse stories. List Scrolls. One of our collectors, Danny Lazzarini, collects found lists. We decided to use her collection as the basis for a participatory project in which visitors would contribute to large lists we put on scrolls flanking Danny's. Again, it took a lot of prototyping to come up with prompts that were suitable evocative to generate interesting responses. Our final four are "Things that scare me," "Things we forget," "Things I can't let go of," and "The best feelings in the world." We have markers out for people to respond, and the lists fill up with diverse responses. We cycle in one fresh list every two weeks so there are always lists that are full to read and others that invite new participants. After big events, they can get packed, but that's kind of interesting too. There has been some sexual innuendo but nothing we deemed offensive so far. Finally, it would feel completely strange to not give shout-outs to the staff and interns who made all of this possible. You may not care about the names of the individuals on our team, but they all deserve a million years of credit and goodwill. And the interns deserve rocking jobs. So thank you to interns Anna Greco, who led the Memory Jar and Deaccessioning development, Nora Grant, who created our Hoarding Anonymous chapter and helped with label writing, Rose Cannon, who developed the personality quiz and a little matching game (not described in this post) for the stairwell, Sara Radice, who made our labels absolutely gorgeous, and Megan Merritt, who made the perfect list scrolls. And of course, our killer exhibitions team, Susan Leask, Marla Novo, and most of all Robbie Schoen, who went above and beyond as preparator to make the most beautiful displays of electric drills and animal skulls that you will ever see. Many other people helped make this project happen, but this is the core team and I am incredibly honored to work with them. And P.S. some of the interns are graduating and moving and we need more fabulous collaborators to heap creative challenges on. Come intern with us. This morning, I checked in on the Pocket Museums on our museum's ground floor. This simple participatory project invites visitors to contribute their own small objects in little alcoves in our bathrooms. We piloted it last year as part of a "behind the scenes" event, and we brought back last month to coincide with a thematic exhibition on collecting and identity. Here's the strange thing. I walked into the women's bathroom and saw what I expected to see--a bunch of quirky objects on display with stories written on post-its. Then I walked into the men's bathroom. No objects. A couple stories. And a lot of screwing around. After I took down all the "kick me" and "kick it" post-its covering the Pocket Museum title label in the men's room, I realized that this is the perfect example of an A-to-B test for gendered response to a participatory museum experience. The men's and women's bathroom got the same prompts and the same supplies in identical spaces. But people have participated in completely different ways. I'm not drawing any major conclusions from this, but it was incredibly interesting--especially since the behavior in the men's bathroom deviated sharply from the range of participatory response we see throughout the rest of the museum. We have seven participatory elements in our current exhibitions on three floors, ranging from voting to talkback walls to an in-depth "make a memory jar" craft activity. The participation is almost 100% on-topic and appropriate. We don't see much screwing around here. People like participating, we take them seriously, and they take us seriously. Men and women use bathrooms differently. A women's bathroom has a slight social function, whereas a men's bathroom does not. Given the chance in a more private, male-only space, men might be more likely than women to mess around. The Pocket Museum activity could be more appropriate for women, many of whom carry bags or purses. If the activity is not as relevant to men, they might use the tools provided to do something else. Maybe women are the lead participants throughout the museum, and they create a normative set of seed content that encourages men to behave comparably in exhibits (but not in bathrooms). I would be surprised if this is the case given my direct observation of visitors in the galleries; however, the Dallas Museum of Art's Ignite the Power of Art study DID show a much higher incidence of participation among women at that museum (62% vs 38% for men, more information here). I'm sure you have many other ideas about why this might be happening... and I hope you share them in the comments. What I think is interesting is that this is noticeable at all. It makes me curious about what other techniques we could use to test differences in participatory response. In general, we try to encourage multi-vocal participation, deliberately ensuring that the seed content represents diverse approaches to the activity or exhibition. We want a broad range of people to feel that there is a place "for them" in the exhibition and to feel connected to diverse participants through the activity. This bridging effect is really important to us. The last thing we want is to become the kind of place where one demographic group participates while another stands back and watches (a problem common to science and children's museums when it comes to kids and adults). Maybe A-to-B testing can help identify some of the subtle differences among our visitors and improve our approach so that we keep making sure that our invitation to participate rings true for our diverse community. And in the meantime, we'll try to get some better seed content in the men's room... or maybe we need a different activity in there. This may be the first time I advocate for gender-segregated exhibit design. What would you do?